Enda Kenny says the AIB chief has written to former executives, asking them to recall their ‘moral responsibility’. THE CHIEF EXECUTIVE of Allied Irish Banks has written to the bank’s former senior executives asking them to consider waiving some of their pension entitlements, it has emerged. Taoiseach Enda Kenny told the Dáil that David Duffy had written to the bank’s former executives asking that they reflect on the request “as an issue of moral responsibility”. The request comes after it emerged last week that AIB used a €1.1 billion to its pension scheme, funded by the taxpayer, to maintain the pensions of former executives who earn up to €500,000 a year. Kenny this afternoon told the Dáil that the €1.1 billion had been provided by the government in order to facilitate the voluntary redundancy of 2,500 workers, as AIB looks to lower its payroll costs, and not to help fund the larger pensions of former staff. This payment ensured that the “voluntary retirement of up to 2,500 staff could actually have done ahead”. 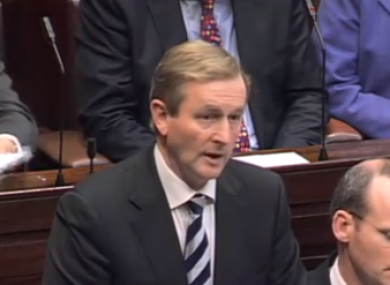 If the payment had not been made, Kenny said, “the consequences would have forced redundancies, and therefore a position that those executives would have continued to receive the extraordinary pension remuneration that they are currently in receipt of,” the Taoiseach said. Sinn Féin leader Gerry Adams described the funding of large private pensions by the taxpayer as “deeply offensive” and pointed out that while in opposition, James Reilly had called for a 99 per cent levy on bankers’ pensions. Kenny said this had actually been a proposal on bonuses and not pensions, but admitted that the government could do little to amend the terms of contracts which had already been agreed upon. “It’s not open to the Minister to change the contractual arrangements that were arrived by a previous administration,” he said, adding that the chief executives of AIB and Irish Permanent – both of whom were appointed since the current government took office – were subject to a €500,000-per-annum pay cap. The technical group’s Shane Ross pointed out, however, that IBRC chief Mike Aynsley receives a pay package of €666,000 a year while Bank of Ireland’s Richie Boucher receives pay of about €620,000. Ross pointed out that the chairman of the latter bank’s remunerations committee, Dermot Walsh, is one of the State’s public interest directors – and said the State had therefore implicitly approved the payment of large salaries and bonuses to senior staff. “What do the public interest directors do, if they don’t sit on the remuneration committee and rubber-stamp these outrageous amounts through? Ross called on the Taoiseach to summon the public interest directors of the guaranteed banks and tell them the government would no longer tolerate the approval of pay rates above the current pay cap. Email “AIB chief executive asks senior executives to give up pensions”. Feedback on “AIB chief executive asks senior executives to give up pensions”.